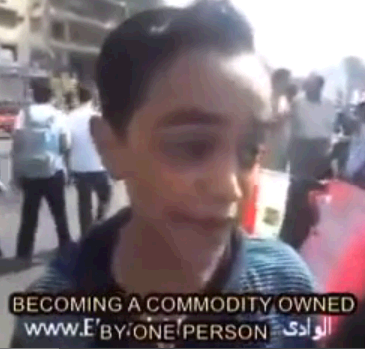 This video of 12-year-old Ali Ahmed speaking about the protest in Egypt is one of the most moving political opinions you will hear – perhaps ever. After all, this is a child and yet he is more engaged in his government than most Americans… He understands the political process, has facts, worries about the rights of women – is concerned about the abuse of power by his government and speaks with a confidence which is absolutely awe-inspiring. The video was recorded last October and already has seen tremendous viewership in China until it was banned. Thanks to the internet, the views of a single global citizen – regardless of age can bring a nation and perhaps a globe to its knees, changing power structures and influencing the ideas of perhaps hundreds of millions. Here is an excerpt – the video is a much watch and there is more from David Feith. I'm here today to help prevent Egypt from becoming a commodity owned by one person and to protest the confiscation of the constitution by one single party. We didn't get rid of a military regime to replace it with a fascist theocracy. The social objectives of the  revolution are yet to be achieved. Economic empowerment, freedom, and social justice. There are still no jobs. The police still jail people randomly. As for social justice, how can a news anchor get 30 million Egyptian pounds, while some people still pick food from the garbage?